Gigado Ashiyuki (active 1813 - 1833) Onoe Kikugoro III as Nikki Sanenori, in the play Meiboku Sendai Hagi, performed at the Takeda za in 1830. Deluxe Oban. An extremely fine print by a collectible Osaka artist. This deluxe piece is extremely rare. The print is known without the yellow background and embellishments and the second state version is illustrated in the definitive book on the Osaka School by Dean Schwaab on page 149. This print is from a pre-production, surimono style, first state edition with the additional use of silver metallics and gauffrage and is quite superb. 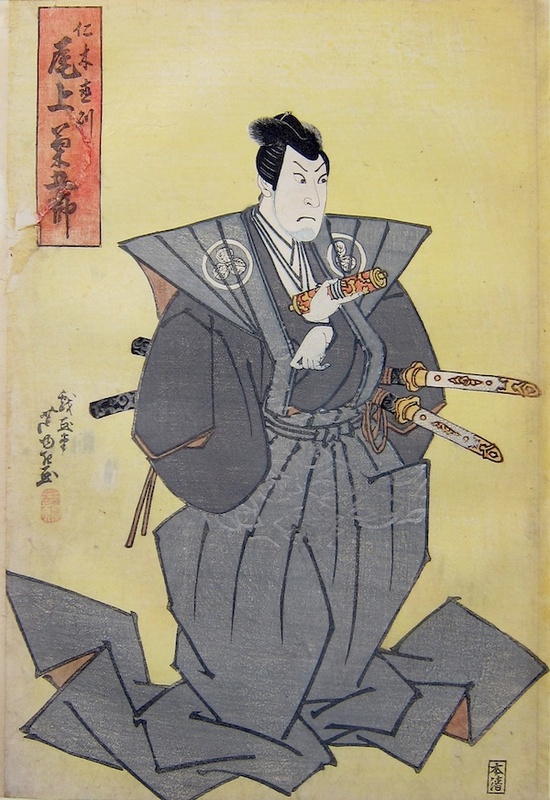 Considered to be one of Ashiyuki’s best designs, the print shows Onoe Kikugoro III as Nikki Sanenori (Nikki Danjo), in the play Meiboku Sendai Hagi which was performed at the Takeda za in 1830. As with many Osaka prints, this piece commemorates that actual performance and was issued shortly after. The piece comes from the high point of his career in the glorious second phase of Osaka print production. It is presumed that he was also a member or at least associated with Yoshikuni’s Jukodo circle, (see previous entry). Nikki Danjo is the enduring pantomime villain of kabuki, who exits the stage via a trapdoor, to re-emerge as a rat, holding a valuable scroll between his teeth. For a fuller description of the character see the entry on Danjo here. Performances by star kabuki actors were hugely celebrated. Osaka was still relatively a backwater and visits for seasons by artists such as Onoe Kikugoro could spark widespread interest in prints and publications leading to the familiar, intermittent production of these high quality prints during the 1820’s. A fine deluxe oban, very good colour with the rare solid yellow ground, a fine impression of the first state of the first edition. The piece has highly unusual reflective decoration to the costume and rich silver metallic embellishments to the sword and other areas. A mark in the top left that extends to the cartouche otherwise very good condition. Signed Gigado Ashiyuki, published by Honsei.